It is easy to carry and use and it comes with a detachable sharpener. 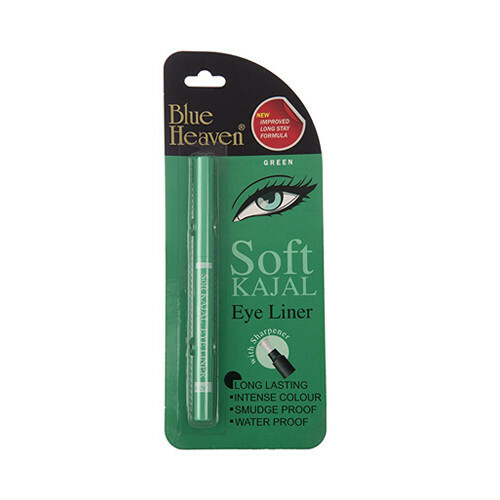 Define your beautiful eyes with Blue Heaven Soft Kajal Eyeliner, It provides the desired intense lines with even smooth application. It is a retractable pencil with high intensity of colour that define your eyes as well as your look .BLUE HEAVEN KAJAL LINER its new & improved formula which comes with Long wear, smudge proof formula packed in a very sleek retractable pencil. It is also provided with a sharpener to give further fine tip. it is long wearing kajal eyeliner which provides the desired intense lines with even smooth application.